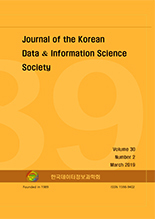 김제원, 강성락,(2019).강원 중부 산지 및 동해안 지상 바람 시계열 스펙트럼 분석.한국데이터정보과학회지,30(2),365-383. 한반도 전체적으로 기상청의 지상 관측 지점은 거의 600 소에 이른다. 하지만, 여기서 관측된 시계열을 이용한 스펙트럼 연구는 매우 드물다. 본 연구는 강원도 산지 및 동해안 지역의 약 65 km × 8 35 km 영역 내 평균 거리 5- 내지 10-km 간격으로 위치한 기상청의 13곳 지상 관측소에서 5년간 수집한 1분 간격 풍속 시계열 자료를 스펙트럼 분석한 결과이다. 풍력 스펙트럼은 십 분 정도 보다 고주파수 영역 즉 십여 분보다 작은 시간 규모에서 명확한 에일리어싱(aliasing)을 보였다. 이는 수집된 시계열의 관측 간격 1분의 니퀴스트 (Nyquist) 주파수보다 고주파수 영역에서 심각한 난류 에너지에 기인한다고 사료 된다. 관측이 복잡한 지형과 해안에 인근 한 지역 내에 이루어졌음을 고려하면, 이러한 강한 난류의 특성은 당연한 결과라 할 수 있다. 이 분석 결과의 실용적 조언은, 특히 산지 및 해안 지역상에서 관측된 1분 간격 시계열의 경우, 이를 10분 평균 또는 이보다 긴 시간에 대한 평균으로 사용하는 것이 바람직하다는 것이다. 이에 더하여 풍속 스펙트럼은 기온과 수증기압 스펙트럼이 1년 주기에서 가장 강한 피크를 보인 것과는 상이하게, 1일 주기에서 가장 강한 피크를 보였다. 즉, 이 지역 바람 장의 경우, 종관장, 계절 변화 또는 연변화와 연관된 바람 장보다는, 해륙풍 및 산곡풍 등 일변화와 연관된 바람 장에 주목할 필요가 있다는 것을 의미한다. 이외에도 본 연구는 여름철보다 겨울철에 스펙트럼 에너지가 크다는 것을 확인하였다. 하루를 기준으로 여름철은 이 이하의 시간 규모 영역에서, 겨울철이 이보다 큰 시간 규모 영역에서 스펙트럼 에너지가 상대적으로 많음을 확인하였다. 이 결과와 바람 장미 분석 결과의 연결에 대하여 본문에 자세히 설명하였다. There have been multiple-year, 1-min time series measurements of surface meteorological variables at more than 600 surface stations in South Korea. As far as the authors know, there is few studies focusing on the spectral characteristics of wind speed time series. Being motivated by this absence, we perform a spectral analysis of 5-year, 1-min wind time series particularly collected at 13 surface stations within a mountainous coastal region of an area about 65 km by 35 km in the eastern Korean peninsula. Based on the composite spectra of the 5-year time series over the 13 stations, we found at least two interesting results. First the wind spectrum shows significant aliasing, particularly in the frequency range higher than about a few tens of minutes, which seems to be caused by considerable turbulence energy. This indicates that the 1-min wind time series needs to be used as averaged values over a period of a few tens of minutes or longer. Second the wind speed spectrum presents the most significant peak at the diurnal cycle, which is somewhat different from those of temperature and moisture in which the annual peak is primary one.